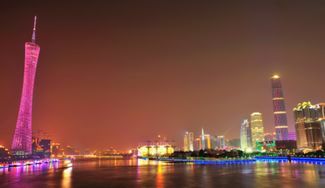 Guangzhou or Canton (广州) , the capital of Guangdong Province, is the third biggest city in China after Beijing and Shanghai with a population of more than 12 million. Founded in 214 BC, the city has been a springboard for trading, cultural exchanges, many revolutions and reforms, making it an unavoidable stopover to understand what shapes the modern China. Guangzhou's isolation from the rest of 'typical China' by mountainous topography and early exposure to the outside world has resulted in its unique way of lifestyle, liberal ideas, distinctive cuisine and tremendous wealth. It is no surprise that Guangzhou is a cradle of many reforms and revolutions that changed the fate of China forever. Today Guangzhou still unveils many republic-era sights that help travelers understand modern Chinese history. Founded in 214 BC, this capital of the richest province is always a mix of new and old. It not only boasts some of the oldest temples in China, a millenarian-old park, an imperial tomb of a southern kingdom and complete preservation of colonial villas and church on Shamian, but it also serves as a showcase of futuristic architectures and autopilot metro on Zhujiang New Town. Despite its vibrant sight-seeing resources, travelers usually come to Guangzhou to shop and eat. Guangzhou accommodates countless huge markets specializing in almost any made-in-china products, including Chinese tea, herbs, garments, watches, electronics and toys. You will be appalled to see the real prices of those China-made products and the profit your local shops earn by selling them. Food is the centerpiece of life and Guangzhou has the country's largest number of restaurants per capita, which is the birthplace of what you call 'Chinese food' (Cantonese food) in the west. Here you can grab the authentic taste of sweet & sour pork, wonton soup and dim-sum. Few travelers can leave the city hungry. As busy as it sounds, you can easily escape the crowd. Just head to surrounding villages, in which some of them date back to the Song Dynasty (960-1279AD). Bird watching in Nansha Wetland, a 200-hectare stopover for migrant birds from as far as Seriba, can easily make for a peaceful day. 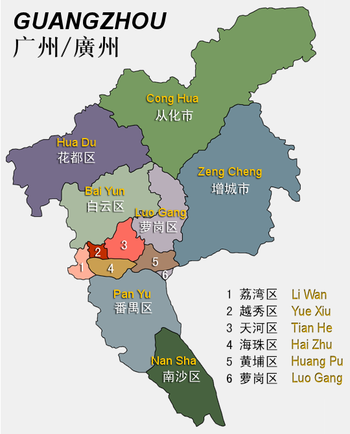 Guangzhou is divided into ten districts. Among them, Yuexiu and Liwan, the cradle for the Cantonese culture, has been the city center since the imperial era. Tianhe, which was a farming village decades ago, has been constructed into a new business center with some biggest shopping malls and highest skyscrapers in the city. For travelers, the most useful road is Zhongshan Road, a 9 KM long highway horizontally cutting through the downtown of Guangzhou. The highway is divided into 8 sections. From Zhongshan 6 Road (中山六路）to Zhongshan 8 Road (中山八路) it covers around 80% tourist attractions and all famous restaurants. This area is well connected by Metro Line 1 from Changshou Lu (長壽路), Chen Clan Academy (陈家祠), Ximenkou(西门口） to Gongyuanqian (公园前). Yuexiu (越秀 Yuèxiù) — The Zhongshan 6 Road area, which covers the original area of Yuexiu before its expansion in the 2005, has been the very core since 214 AD. Highlights include Yuexiu Park, Guangzhou Museum located at Zhanhai Tower, Orchid Garden, Mausoleum of Nanyue King, Guangxiao Temple, Temple of Six Banyan Trees, Huangsheng Mosque, Beijing Lu Shopping District, Sun Yat-Sen Memorial Hall, Temple of Five Rams, Shishi Cathedral. It also has many popular wholesales market including Yide Road Market and Baima Market. Liwan (荔湾 Lìwān) — On the north of the pearl river makes up the old Guangzhou area and home to the standard Cantonese accent (Xiguan Accent, literally West Gate Accent). Tourist highlights include the colonial Shamian Island, Xiguan Old Houses, Xiangxiajiu shopping Street, Liziwan Lake Park and Chen's Clan Academy. Tianhe (天河 Tiānhé) is the business district, thriving with many skyscrapers and shopping malls. The newly developed Zhujiang New Town (珠江新城) is a showcase of futuristic urban planning and avant-garde architecture. It is also home to the oldest messy urban village Shipai as well as most expat communities. The district serves as a transportation hub for trains to Hong Kong. Highlights include Guangdong Museum, Central Library, Opera House and Shipai village. Haizhu (海珠'Hǎizhū') — At the south of the Pearl River, the former industrial district has transformed into more residential and business today. It is home to the city's latest landmark Canton Tower and the South Campus of Sun Yat-Sen University, which is a well-preserved historic building complex of the 1920s. Traders come here often for the Canton Fair in Pazhou. Panyu (番禺 Pānyú) is an area getting more popular among local tourists. Its Lianhua Mountain boosts 100,000 blooming lotus flower and sits a huge Bodhisattva Guanyin statue. Various theme parks have attracted thousands of tourists. The area is covered by many historic villages and towns that give you a peek into the life of traditional Southern Chinese. Baiyun (白云 Báiyún) — This district is where the old airport is located. The Baiyun Mountain is a major attraction. Huangpu (黄埔 Huángpǔ) is home to Huangpu Military Academy. Nansha (南沙 Nánshā) is a newly developed area at the southern tip of the city. Rural as it may sound, it keeps the survival of the Nansha Wetland, a stopover for migrant birds. Many Chinese worshipers also like to visit the Palace of Heavenly Queen (天后宮). The High-Speed Railway Station (South Station) is built here. Luogang (萝岗 Luógǎng) is famous for its plum forest and Tianlu Lake Forest Park. Huadu (花都 Huādū) is where the New Baiyun International Airport is located. Zengcheng (增城 Zēngchéng) is famous for its lychee fruit, which are picked in June and July. Conghua (从化 Cónghuà) is popular among tourists for its hot springs and Tianhe (Heavenly Lake) Recreation area. Formerly known as Canton in the West, the city of Guangzhou has a history dating back roughly 2,200 years. A legend tells of five celestial beings riding into the area that is now Guangzhou on five rams carrying sheaves of rice. The celestials bestowed blessings on the land and offered the sheaves to the people of the city as a symbol of prosperity and abundance. After the celestials left, the rams turned into stone, and Guangzhou quickly developed into an affluent and influential city. Due to this legend, Guangzhou has gained several popular nicknames: Yangcheng (羊城; City of Rams), Suicheng (穗城; Sheaves of Rice City) and Wuyangcheng (五羊城; City of Five Rams). In addition, due to the abundance of flowers along the city's main thoroughfares, Guangzhou is often referred to as Huacheng (花城; City of Flowers). According to historical records, the city was built in 214BC and was known as Panyu (番禺). The name Guangzhou actually referred to the prefecture in which Panyu was located. As the city grew, the name Guangzhou was adopted for the city itself. As a major sea port, Guangzhou's history is full of color. In 786 the city was sacked by the Persians and in 1711 the British East India Company established a trading post here. In 1757, the government designated the city as the only port allowed business transactions with foreign nations. This continued until 1842, the signing of the Treaty of Nanking, when four other ports were added. Losing the exclusive privilege pushed Guangzhou to become more industrialized later. Guangzhou was also part of the so called "Maritime Silk Road" that linked southern China with India, South-East Asia, the Middle East, and Africa. As a result of its links with the Middle East, a mosque was established in the city in 627, and a small Muslim community continues to live in Guangzhou to this day. Additionally, the sixth patriarch of Zen Buddhism was born in Guangzhou and taught the famous Platform Sutra in the city. 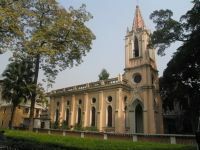 As a result, Guangzhou has retained a strong connection with this school of Buddhism, and the monastery where the sixth patriarch studied is considered a local treasure. The first Protestant missionary in China, Robert Morrison, entered Guangzhou in 1807. Guangzhou has a humid subtropical climate, influenced by the East Asian Monsoon, with plenty of rainfall throughout the year, measuring 1.736mm on average. Extremes have ranged from 0°C (32°F) to 39°C (102°F). Winters are mild with the average temperature in January being 13.9°C (57°F). Cold weather is virtually unknown in Guanghzou since the cold air masses originating in Siberia don't make it this far south and are blocked by the mountains in the north. Small portions of them however, may manage to penetrate through the moountains and reach the city, pushing low temperatures down to 5°C (41°F), but very rarely below, although due to the strong cold winds and humid weather, it does feel very chilly, while Snowfall is extremely rare, with the last occurence being in 24th January 2016, 87 years after the previous one. Summers, like the rest of southern China are hot and very humid. The heat is sweltering, due to the fact that the average high temperature in July is 32°C (90°F) and the average humidity is 82%, making the atmosphere very unpleasant. Daytime highs may surpass 35°C (95°F) up on occasion. October and November are inarguably the best months to visit Guanghzou and most of rain falls between April and September. Guangzhou Baiyun International Airport (广州白云国际机场, IATA: CAN, ICAO: ZGGG, ) is a major hub in Southern China, second only to Hong Kong. The airport is the base for China Southern Airlines  and has an extensive range of domestic flights including: Beijing, Changchun, Changsha, Chengdu, Chongqing, Dalian, Daxian, Guiyang, Guilin, Hangzhou, Harbin, Haikou, Hefei, Hohhot, Jinan, Jiuzhaigou, Kunming, Luzhou, Nanchang, Nanjing, Nanning, Qingdao, Sanya, Shantou, Shanghai, Shenyang, Shenzhen, Shijiazhuang, Taizhou, Tianjin, Urumqi, Wanxian, Wuhan, Wuxi, Xi'an, Yibin, Yichang, Yiwu, Yuncheng, Zhengzhou, and Zhuhai. Direct international routes include Adelaide, Amsterdam, Auckland, Bangkok, Brisbane, Busan, Cairns, Doha, Dubai, Frankfurt, Fukuoka, Hanoi, Ho Chi Minh City, Hong Kong, Istanbul, Jakarta, Kathmandu, Kuala Lumpur, London, Los Angeles, Macau, Manila, Melbourne, Moscow, Mumbai, Nairobi, New York City, Paris, Perth, San Francisco, Seoul, Singapore, Sydney, Taipei, Tel-Aviv, Tokyo and Vancouver. Foreign nationals from 51 countries who transit through Guangzhou Airport when flying between two different countries (for example, London-Guangzhou-Auckland) qualify for a 72-hour visa-free stopover. For the purpose of the policy, Hong Kong, Macau and Taiwan are treated as international flights (for example, London-Guangzhou-Taipei would qualify). The name of the policy is a bit of a misnomer, as the 72 hour period actually begins at 00:01 after the day of arrival (for example, if you arrive in Guangzhou Airport at 09:00 on 1 January, you can stay until 23:59 on 4 January). During the 72 hour visa-free stopover, you are allowed to move freely within the whole of Guangdong Province, but you must fly into and fly out of Guangzhou Airport. For details, visit the FAQs webpage (in English) of the official government website of the Guangdong Province Division of Exit & Entry Administration. Warning: Immigration at Guangzhou has denied 72-hour visa-free stopovers for those with Turkish stamps in their passport. Those with less than 8 hours between flights are also regularly denied entry - despite rules to the contrary. If you plan on enjoying an extended stay in Guangzhou under the visa-free system you are taking a risk. If you are flying on China Southern Airlines and have a stopover in Guangzhou, you may qualify for complimentary hotel accommodation. For details, visit the China Southern website. The food in the international transfer terminal is very expensive. You can pay US$10 plus for a cup of tea! It is recommended to bring everything you will need for your layover. There is a free hot water machine downstairs, next to one of the smoking lounges. If you bring a mug, and some tea bags, you will be good to go for hours. The airport is 28 km (17 mi) north from central Guangzhou. The most convenient way into the city is by Metro Line 3. The lower level of the airport terminal leads to the Airport South Metro station. A journey to the East Railway Station, or to Tiyu Xilu Metro station (both ¥12) takes about 50 minutes. Trains run every seven minutes, with the first train leaving the airport at 6AM and the last train from and to the airport departing at 11PM. Taxis are also available and take about the same time as the Metro. A taxi ride to central Guangzhou will cost about ¥120, inclusive of a ¥15 toll fee. Taxi stations are available outside Arrival Hall Section A Gate 5 and Arrival Hall Section B Gate 6. If you arrive after midnight when the metro has stopped running, be prepared for a real long wait in line for taxis. Waiting times can start from 45 mins, not because of the lack of taxis, but because of the sheer number of arrivees. Also, do not be surprised that the queue is not really an orderly queue, which is quintessentially chinese. Some parts it's 2 people, some parts it's 4, and towards the front it can spread out to 8 in a row. People will attempt to out squeeze you to the back at every opportunity possible. You may find yourself 10 spaces behind the person who started right behind you. Seeing rural Guangzhou from an Airport Express bus. Airport Express buses operate just outside the arrival terminal, but are a distant second to the metro in reliability and comfort. If you have more than one piece of luggage or if a line has a stop at your hotel, this may be your top choice. Line 1 (¥16) departs every 10-15 minutes from 7AM until the last flight and takes 45 minutes to reach the Guangzhou Railway Station and Central Hotel. The ticket prices range from ¥10-55. Lines 1 to 6 are traveling within the metropolitan area, while lines 7-11 go to outer districts. There are also direct Airport Express buses to some cities in the Pearl River Delta region, such as Zhuhai and Foshan. However, there is no direct bus to Macau or Hong Kong. Do not accept solicitations for rides to the city. Sometimes, people will stand at the arrival area and ask if you need a taxi. These are illegally operated and use unmarked vehicles, or charge you a fee, offer you a phony receipt, and then arrange a taxi that will still charge you. They usually cost a lot more than licensed taxis since many travelers do not know the cost of airport transportation. Flying to/from Hong Kong International Airport (IATA: HKG) is another option. From Hong Kong International Airport, you can take cross-boundary coach to Guangzhou and other cities in Guangdong. Service providers include China Travel Service, Trans-Island Chinalink and Eternal East. Fares range from HK$220-250 one way. Trains cover the 182 kilometers from Hong Kong in about two hours, including a stop at Dongguan. Through Trains to Guangzhou East Railway Station depart from Hong Kong at Hung Hom railway station in Kowloon and arrive in Guangzhou at the East station. Through train services are operated by Hong Kong MTR. . The one-way journey price ranges from 190HKD-230HKD. Note: Tickets purchased on it3.mtr.com.hk must be paid for by credit card and collected in Hong Kong by the card holder. If you intend to begin your journey from Guangzhou, most times of the year you can obtain tickets on the spot at Guangzhou East Railway station. However, at peak season, you will want to book ahead to have a reserved seat. Booking (and paying for) tickets through the MTR website will only RESERVE your seats if you are outside Hong Kong and intend to begin your journey in Guangzhou. You will need to pay again at Guangzhou East station and then seek a refund from MTR once you arrive in Hung Hom. To avoid this, MTR has an officially appointed ticketing agency on the China side for multilingual inquiry and booking.This company has been confirmed by MTR customer service and is: Norrway Trading Co. Ltd. (+86) 20 8765 9328, from within China 020 8765 9328 (no known website). Alternatively, China International Travel Service has non-real time inquiry and booking service in English. There are a number of other avenues (Chinese travel agents) for inquiring and booking GZ-HK MTR tickets, but they are in Chinese (e.g., www.020ztc.com), who have an office on the first floor of Guangzhou East station. Many of the better quality hotels in Guangzhou will also have an affiliated travel agents where you can book and pay for train tickets, so contact them as well. Reservation for Guangzhou-Kowloon trains usually opens 28 to 30 days before departure. It is cheaper to take the Guangzhou-Shenzhen intercity train service (广深城际列车) from Shenzhen to Guangzhou East Railway Station. Some trips also stop at Guangzhou Railway Station. Shenzhen is right across the border from Hong Kong and thousands of people walk over the bridge between the two every day through Luohu (罗湖), or spelled as Lo Wu from the Hong Kong side of the border. Tickets can be bought at the Shenzhen Rail Station in Luohu. The one-way journey price starts from ¥80. A project is underway to link the entire Pearl River Delta area with high speed rail network. The Guangzhou–Zhuhai (near Macau), Guangzhou–Shenzhen High Speed Rail (a different railway, originating from Shenzhen North Station and terminating in Guangzhou South Station, than the Guangzhou-Shenzhen intercity train mentioned above) have opened in 2011, and the journey takes just 57 minutes and 35 minutes respectively. A new long distance line from Guangzhou to Beijing travels through major cities such as Changsha, Wuhan, Zhengzhou and Shijiazhuang. It takes 7h59m to 9h38m for a journey to Beijing, over 2,000 km away. One way ticket is ¥865. There are also overnight soft sleeper bullet trains for ¥990 on most days of the week. Some high-speed trains also go to Luoyang and Xi'an. One way trip from Guangzhou South Station to Xi'an North is between 7h40m and 9h09m, price from ¥813.5. This is part of a nationwide high-speed network. The above mentioned destination are also accessible by much slower non-high-speed sleeper train from Guangzhou Station in the center of the town. It is easy to go to Guilin and Yangshuo by bullet train before moving on to rest of China. It will take 2h31m to 3h8m and costs ¥137.5. Guilin is also accessible by non-high-speed sleeper train from Guangzhou Station right in the center of the town, which takes about 11 hours. It is possible to take a direct train from Guangzhou to Lhasa in Tibet. The 4,980 km journey takes 55 hours and runs every other day from Guangzhou Station (广州站). A sleeper costs ¥869 and up. For discussion see Overland to Tibet. For reservation on all the train tickets except tickets to Hong Kong, Chinese Railway do have a online ticketing website and smart-phone app, but it's all in Chinese and only accepts Chinese debit or credit card. For English speaker with no access to a Chinese bank account, follow the tips on seat61.com, which gives very thorough instruction on how to buy train tickets from major reputable online travel agencies. Bear in mind there are now three major train stations in Guangzhou. Countless travelers have gone to the wrong station and missed their scheduled trips, so be sure of your departing station, which is specified on the ticket. Guangzhou Railway Station (广州站) is one of the biggest in the country and services non-high-speed routes that go all the way to Harbin. Metro lines 2 and 5 have a connection stop here. Guangzhou East Railway Station (广州东站) services non-high-speed routes to Hong Kong and some other mainland cities. Metro line 1 ends here, and Metro line 3 from Airport South has a station here. Guangzhou South Railway Station (广州南站) serves ONLY the high-speed rail network. Guangzhou also has several other stations such as the North Station and West Station. There are also different names for each of the stations. Be sure to use official names to avoid confusion. Although some signs are available in English, most of the staffs do not really understand and speak English, except at the Guangzhou-Kowloon ticket counter, in which staffs are generally able to communicate in simple English. Bring a phrasebook or a Chinese friend if you're planning on traveling deeper into China. Coach services are available to bring passengers from Hong Kong International Airport to several locations in Guangzhou. Among the destinations are recognizable landmarks like Jinan University (暨南大学) on Huangpu Avenue (黄埔大道), Garden Hotel (花园酒店) and China Hotel (中国大酒店) (see hotel section). The trip takes about 3+ hours and costs 250 HKD. There are also cross border bus terminals throughout Hong Kong. One of the Stations is at Austin Road and Canton Road near Kowloon Park. A one way ticket costs about 100 HKD. Provincial Station (省汽车客运站) (145-149 Huanshi West Road 环市西路145-149号) (Metro 2 & 5 Guangzhou Railway Station Exit F1, F2, H1, H2) The station serves mostly long distance lines outside the Guangdong Province. Liuhua Station (流花站) (Metro 2 & 5 Guangzhou Railway Station Exit D4) Across from Provincial Station, it mostly serves nearby cities in the province. Tianhe Station (天河客运站) (633 Yanling Road 燕岭路633号) (Metro 3) The station services Southern and central China, reaching as far as the Gansu Province. There are also many routes to cities in Guangdong. Haizhu Station (海珠客运站) (182 Nanzhou Road 南洲路182号) (Metro 2 Nanzhou Station Exit A) The station is located in the southern part of Haizhu, servicing major cities in the province and other Southern China provinces, including Hainan. Fangcun Station (芳村客运站) (51 Huadi Middle Avenue) (Metro 1 Kengkou Exit B) The station serves similar routes as the Haizhu Station. Yuexiu Nan Station (越秀南汽车站) (越秀南东园横2号) Other than desintations in the province and other provinces, it also has lines to Macau and Hong Kong. Guangzhou South (广州南汽车客运站) The station mainly services nearby cities. There is a bus to Lo Wu, a commonly used border crossing between Hong Kong and mainland China. The fare is ¥65 and it runs every hour. Please note that English and Chinese names of bus stations vary from one sign to another -- coach terminal, coach station, bus terminal, bus station, passenger terminal or passenger station. Be aware that the different names may be referring to the same station. There used to be frequent ferry services from other cities in the Pearl River Delta, as well as some cities in Guangxi and along the coast, for example, Xiamen, Haikou or Shanghai. But nowadays, along the construction of extensive highway, water transportation no longer have its value as they used to. There is currently no ferry terminals in downtown. The two major ferry terminals are Lianhuashan Port Ferry Terminal (莲花山客运港) in Panyu District and Nansha Port Ferry Terminal (南沙客运港) in Nansha District. Lianhuashan Port Ferry Terminal (莲花山客运港) in Panyu has ferry service to two locations in Hong Kong: Kowloon (China Ferry Terminal or China HK City, both refer to the same terminal in Hong Kong) and Hong Kong Intl Airport Sky Pier. Service to Hong Kong Intl Airport Sky Pier is for transiting passenger at Hong Kong Intl Airport only, as passenger will be transferred directly between Sky Pier and airport terminal, without clearing immigration in Hong Kong. Passenger taking this service need to have a flight reservation departing Hong Kong on the same day with the minimum connecting time of 120 minutes in Hong Kong. Traveling from downtown Guangzhou to Lianhuahan takes about an hour by car, complimentary shuttle buses are available to or from several locations in Panyu, including Panyu Square Station on Metro Line 3 and Shiqi Station on Metro Line 4. Alternatively, public buses are available from Shiqi Station on Metro Line 4. Nansha Port Ferry Terminal (南沙客运港) in Nansha has services to two locations in Hong Kong: Kowloon and Hong Kong Intl Airport Sky Pier. The trip takes 75 minutes to Hong Kong. Note that Nansha is extremely far from the city center, as traveling between downtown Guangzhou to Nansha is about 75 minutes.Free shuttle buses are available to or from several locations in Panyu, and at Garden Hotel (花园酒店) for passenger traveling to Hong Kong Intl Airport only. The port is 1.6km south of Humen Bridge in Nansha. Look for Guangzhou Lian Hua Shan at the 4th table. Look for Guangzhou at the 6th table. Page is in Chinese but there is English on the schedule. Page is in Chinese but there is English on the schedule. Service available every THURSDAY and SATURDAY only. Public transportation system is comprehensive in Guangzhou like most other big Chinese cities. If you stay in Guangzhou for long time, purchase a multi-purpose Ling Nan Tong - Yang Cheng Tong (岭南通-羊城通) stored value card, which can be used to pay fares in metro, bus and ferries and used for many convenience stores, public phones and vending machines. However, to return the card at the end of the trip, you need to go Gongyuanqian (Exit J) and Tiyu Xi Exit G, and East Railway Station. (Exit HJ). It may be worth simply keeping the card as a souvenir. Despite the sheer size of the city, walking is a great way of exploring the traditional Liwan and Yuexiu districts. The easy tour is to walk through Zhongshan 6 Road (中山六路, Zhongshan Liulu) which covers most tourist attractions including Liurong Temple, Guangxiao Temple, Huaisheng Mosque and many huge markets. 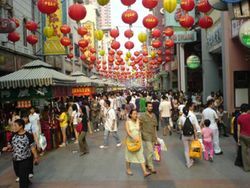 It also has the two most popular pedestrian streets , Beijing Lu and Shang-xia-jiu for shopping mania. To give you some sense of direction whenever you get lost, figure out the location of two major horizontal lines, which are Zhongshan Road and the Pearl River (Zhu Jiang) , you will easily tell every direction. 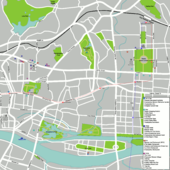 This area is also well connected by Metro Line 1 and Trolleybus 104, 107, 109 and 78(Night Bus) which is the only trackless tram system in South China. Bicycles are promoted as a low-carbon mode of transportation. Over 100 rental outlets are now available along many BRT lines and subway stations. The rental fee is by the hour and up to ¥30 a day. One popular bike route is along the Pearl River on the Haizhu District side. Other dedicated bike lanes are slowly appearing in the city center, including Tianhe District. Yangchengtong Card is accepted in many public rental outlets. New bikes are available in major hypermarkets from ¥500 for a reasonable cheap single-speed to around ¥2000-3000 for a 21-speed mountain bike. Giant and Merida are the two most common international brands. High-end bicycles are also available to affluent customers in this rich city. You will see brightly colored shared bikes almost anywhere nowadays. In order to rent these, you must create an account with their respective APPs, including passport number and WeChat/AliPay/Chinese bank card. The most popular in Guangzhou are Mobike, Ofo, Bluegogo, and Xiaoming. After paying a deposit between ¥50-200, each half hour is generally ¥0.5-¥1. Folding bikes are permitted on the subway (sometimes not on buses) and tax, but non-folders are not permitted on any form of public transport other than the cross-river ferries. Bicycles are not permitted to cross the river via the Zhujiang Tunnel or Zhujiang suspension bridge, but are permitted to go on the public ferries for ¥1 (see below). Opened in 1999, the ever-growing Guangzhou Metro system covers much of the city center. The fare ranges from ¥2 to ¥12. Most of the signs and announcements are in Chinese and English. If you stay in Guangzhou for extended period, think of getting a Yang Cheng Tong transportation cards (see details above). Card holders can get 40% off on any rides since the 16th uses in every month. Line 1 is the most useful for tourists, horizontally cutting through the center of Guangzhou. Five major stations Huangsha, Changshuo Lu, Chen Clan's Academy, Ximenkou, Gongyuanqian cover up to 80% tourist sights. 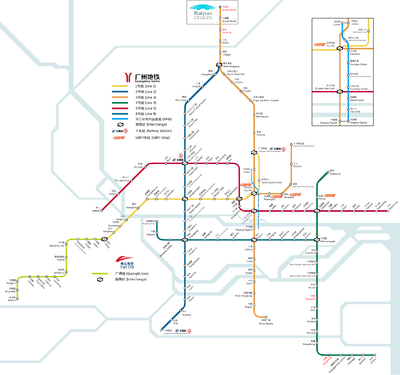 Line 2 runs horizontally through Guangzhou South Station and Yuexiu Park. Line 3 is a Y-shaped eastern Guangzhou. The 'main line' runs from Panyu Square to the Tianhe Intercity Coach Station, whilst the 'branch line' splits off at Tiyu Xilu and heads towards Airport South. Line 5 runs east-west from Jiaokou (Liwan District) to Wenchong (Huangpu District) and follows the inner ring road through the city. Useful for reaching Guangzhou Railway Station, the Garden Hotel and Zhujiang New Town. Line 4 serves Guangzhou's eastern outer suburbs and runs from Huangcun in Huangpu District down to Jinzhou in Nansha. This line is most useful for reaching the Olympic Sport Centre and the University Town. Line 8 was formed out of the remnants of Line 2 following it's southward extension and runs east-west through Haizhu District from Fenghuang Xincun to Wanshengwei. Useful for reaching Sun Yat-sen University and Pazhou Exhibition Centre. Zhujiang New Town APM is an experimental autopilot metro system which takes you to the Canton Tower. You need a separate 2yuan ticket to get a ride. Guangfo Line is China's first intercity railway, connecting downtown Foshan with Xilang, where you can transfer to Line 1. Central Foshan can be reached in approximately 45-60 minutes from central Guangzhou. Transfers from GZ metro lines and Yangchengtong cards are accepted. Guangzhou bus network is comprehensive. Bus fares are ¥2 for adults and ¥1 for children, disables and senior citizens. However, information at bus stops is mostly written in Chinese characters. A current stop's name may be displayed in pinyin or English on a LED display panel as long as it is available. On-board announcements are made in Mandarin, Cantonese and mostly English as well. Buses are only handy for traveling within one district or for reaching suburban districts that are not served by the subway. Heavy traffic can lead to a slow, uncomfortable journey although they can be handy for a cheap but slow sightseeing tour. 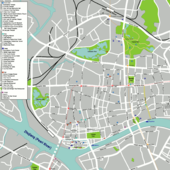 Trolley bus lines (Routes 101-109) are handy for exploring Liwan and Yuexiu districts. Most bus routes run from around 6am to 10 or 11pm, after which there are night buses with the prefix 'Ye’ (夜, night). Night route numbers are not related to the normal route numbers. The fare is usually ¥3 - ¥4. There are more than 100 night routes, but most of them stop running in between 12:00 to 1:30am, and some start again around 5am. In most cases, taking a taxi after midnight and before the sunrise is a better idea. Guangzhou has over 30 commuter express bus lines (高峰快线) run mostly during peak hours from major bus and subway interchanges to congested areas and outlying districts. Fares are from ¥1-4. There are also four special lines for University Town (大学城专线). You can find these in most major stations in the city that would take you to University Town. Fares are from ¥2-4. There are also 2 tourist bus lines (旅游专线) passing through many scenic spots in the city. Other special lines are: Lines to some commercial districts, shuttle buses for many different residential complexes such as Favourview Palace and Star River, and even complementary shuttle buses for some shopping center. The driver of a shuttle bus may ask for your receipts. The Bus Rapid Transit system went into service in early 2010. It is essentially a long segregated bus lane (not an elevated busway like in Xiamen) running along the Tianhe Road and Zhongshan Avenue corridor towards the eastern suburbs. Some intersections are traversed by bridges and tunnels, which cuts journey times considerably, but other intersections have traffic lights and therefore traffic jams, and crowds can be as dense as in Metro stations but with fewer doors and a narrower standing area compared to Metro trains. All buses that use the BRT start with a B prefix (B1, B22 etc. ), though some without the "B" stop nearby. When reading a bus route (in Chinese) you can see the BRT logo above each BRT station name, like the GZ Metro logo above bus stops that are near Metro stations. The B1 stops at every BRT station, but other B routes use any number of BRT stations (sometimes just one) and use normal roads the rest of the time. If boarding a BRT bus at a normal (non BRT) bus stop, the normal fare of ¥2 applies, however you can transfer to other BRT routes for free, provided you transfer at a BRT stop. If boarding at a BRT stop, insert ¥2 (coins only) into the entry turnstile to enter the platform area; no payment is required when boarding the bus, and you can board at the rear. As with normal bus routes, there is almost no English at BRT stations, and only the current station name is in pinyin. Overall it isn't much use to tourists. This is the most popular way for foreigners to get around, and it is very affordable. The starting charge is ¥10 for the first 2.6 kilometres, and after that ¥2.6 for each kilometre. No fuel surcharge is added, but a 50% surcharge is automatically added when the trip reaches 35 kilometres. A few of them also accepts Yang Cheng Tong as payment, but it is not preferred by the drivers. The taxi hotline is 96900. This comes in handy if you forget your valuables in a taxi. Save your receipt because it contains the taxi's identification number. Most taxi drivers do not speak English or any other foreign languages, so have the name and address of your destination written in Chinese to show the driver. Many are from the poorer northern provinces and do not even speak Cantonese. If your destination is not well known, have a nearby landmark included in the address, e.g. "across from the Garden Hotel." Whilst the majority of taxis are the regular VWs and Hyundais found in almost all Chinese cities, there are an increasing number of 'London taxis' on the streets of Guangzhou (which comes as no surprise as the latest generation of London black cabs are built by Geely Motors in China). In Guangzhou they are known as "old-fashioned" cabs (老爷车，lao ye che) They are wheelchair accessible and can carry up to 6 passengers. Many people recommend using the yellow taxis as that company only employs local Guangzhou drivers who know the city well - other taxi companies usually hire migrant workers from other provinces who may not know where they are going. Beware of taxi driver as sometimes, in addition to going around the block one too many times, they will also try to pass counterfeit notes. Pay close attention as to what they pay when passing toll booths. Good drivers will show you the toll receipts. Only add the toll amount to what is displayed in the meter. A trip between the airport to the East Railway Station cost around ¥120-130. Most people find taxi drivers in Guangzhou to be honest. However, during the Canton Fair near the Pazhou Complex, it is common to see drivers violate rules, such as refusal of service and pre-negotiating a price rather than using the meter. It is also difficult to find a taxi available elsewhere in the city. Most taxi shift changes take place between 15:00-17:00. During this time, it is hard to find a taxi as many drivers stop working by displaying the "out of service (暂停服务)" sign before the end of the shift, unless you are going in their direction. Taxi can be also hard to come by during commuter peak hours of 19:30-09:00 and 17:00-19:00. Finding a taxi at night is usually not a problem. Uber has no presence in Guangzhou. However, there is a local service provider called "DiDi". It operates similar to Uber and has an app in English which becomes very helpful for the expat community. But the payment mode can be done only through wechat, so you need to have a wechat account to book a cab through DiDi. The prices are very cheap compared to other countries and is very safe and reliable. While driving in Guangzhou is an option, drivers unfamiliar with the driving conditions in China's large cities should be aware of the risk and potential compensation incurred. Many car rental companies offers a driver as well. See also Driving in China. Although a convenient way to navigate the city's back alleys and lanes, motorcycles are banned in the city center, and riding a motorcycle into these prohibited areas can lead to fines and possible confiscation of the bike. In addition to the central motorcycle ban, electric bicycles are banned from the city roads. The ferry is the cheapest way of crossing the Pearl River (Zhujiang). They were very popular in the 1980s and early 90s, carrying tens of thousands of passengers across the river each day. Nowadays its popularity declines greatly, mostly because of the construction of many bridges along the Pearl River and the availability of other public transportation. The river narrows while going through the city center (a bit wider than the Thames in central London). It is usually faster and more convenient to use the bridges or public transport(metro, bus) to cross the river than wait for the ferries. 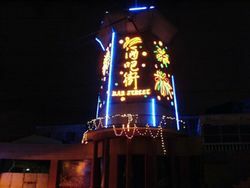 One ferry route that maintains its popularity operates between the Huangsha Pier by the seafood market next to Shamian Island and the pier on Bai-e-tan Bar Street (Changdi Road) in Fangcun. It departs every 10 minutes from 6AM to 10PM. The fare is ¥0.5 for a foot passenger or ¥1 if you bring a bicycle. The fare can be paid in cash (no change given) or by using Yangchengtong Card. There are separate boarding gates for cyclists and pedestrians, and you pay at the boarding gate. Mandarin is the official language as is spoken by everyone other than some of the older generation. All true Guangzhou locals speak Cantonese, and if you visit areas such as Liwan and Yuexiu, this is the predominant language spoken on the street. Migrants from other parts of China will speak Mandarin. Local people take the preservation of their dialect so seriously that they even marched to the government office to protest against a plan to limit the use of Cantonese in TV and radio broadcasting. English is spoken by more people than in the rest of China (save for Beijing and Shanghai), but still not by the majority, so it is a good idea to carry your hotel's business card with you. Do not expect drivers to speak English, some of them can't even speak Mandarin without a heavy accent. To save yourself the hassle and agony when asking for directions, have names of your destinations clearly written down in Chinese by the hotel staff before venturing out. That said, many educated younger people will have a basic knowledge of English and staff at hotels as well as bars and restaurants widely visited by foreigners generally speak an acceptable level of English. Staffs at Starbucks generally speak acceptable English and high school or college students can generally understand basic English as well, but not for speaking. If you find a Chinese people on the street who speaks English fluently, then you most likely run into either someone working at a foreign company, a highly educated student or a person who has studied abroad. Despite the fact that not the majority of people speak English, but the signs are often in Chinese and English, even though sometimes the English version doesn't really make any sense or obviously translated by google. Xiguan Residence (西关大屋 xī-guān-dà-wū) and Cantonese Arc (骑楼) See the traditional Cantonese architectures from the late Qing Dynasty and early Republic Era. These houses can be found in Haizhu South Road(海珠南路), Duobao Road (多宝路), Baohua Road (宝华路), Longjin West Road (龙津西路) and Shangxiajiu Road (上下九路). One of the most famous ones is located at 18 Baoyuan North Street (宝源北街18号). They were occupied by the upper class in the old days. Sun Yat-Sen Memorial Hall (中山纪念堂 zhōng-shān-jì-niàn-táng) (Metro 2 Sun Yat-Sen Memorial Hall - Exit C) located on Dongfeng Middle Road, is dedicated to the founder of the Republic of China and local hero Dr. Sun Yat-Sen. It was constructed in 1931 and built on the original site of Sun Yat-sen's presidential office on Yuexiu Hill. Open 8AM-6PM. Admission is free for the park and ¥10 to go inside the hall. Shamian Island (沙面岛) (Metro 1 Huangsha Exit D) The buildings and streets of the former British and French concession have been beautifully renovated, creating an oasis of tranquility in an otherwise bustling and hectic metropolis. One of the old structures is Our Lady of Lourdes Chapel, located at 14 Shamian Street. The architecture reflects the colonial era of 19th Century, and it has a unique atmosphere. Canton Tower (广州塔) (Metro 3, APM Chigang Pagoda) is the second tallest structure in China. In additions to the observation deck, the tower features various restaurants, a 4-D theater and other entertainment venues. Admission is ¥150. Bright Filial Piety Temple (Guangxiao Temple) (光孝寺 guāng-xiào-sì) 109 Guangxiao Road (光孝路) (Metro 1 Ximenkou Exit C) – As the sixth patriarch of Zen Buddhism, Hui Neng, trained at this temple in the 7th Century, it is a popular pilgrimage site for Zen Buddhists. The temple has been destroyed several times by fire, and the current buildings date back to the mid-19th century. Admission is ¥10; free if you eat at the temple's vegetarian restaurant (菩提甘露坊). You can also apply your admission toward your meal. Liurong Temple (六榕寺 liù-róng-sì) 87 Liurong Road (六榕路) (Metro 1 Gongyuanqian Exit I)– The Temple of Six Banyan Trees, which includes the 17 story, eight-sided Hua Ta, or Flowering Pagoda, is one of the most popular attractions in Guangzhou. The temple dates back to the 6th century, while the pagoda predates it by about 300 years. Admission is ¥5; Flower Pagoda ¥10. Wu Xian Guan Temple (五仙观 wǔ-xiān-guān) Huifu West Road (惠福西路). (Metro 1 Ximenkou Exit C) Admission is ¥5. Huaisheng Mosque (怀圣寺 huái-shèng-sì) 56 Guangta Road (光塔路) (Metro 1 Ximenkou Exit C). This is one of the oldest Muslim mosques in China, built in 627. The mosque is open to Muslims only and not open to the general public, but you can take a peek outside. Shishi Sacré-cœur Catholic Cathedral (石室圣心大教堂 shí-shì-shèng-xīn-jiào-táng) 56 Yide Road (一德路旧部前)(Metro 2 Haizhu Square Exit B1).It is one of the oldest church structures in the city, and the largest of its kind of Southern China. It is currently in use for worship. Visiting hours are weekdays 8:30-11:30AM and 2:30-5:30PM; weekends 8:30AM-5PM. Free admission. Sanyuan Temple (三元宫 sān-yuán-gōng) Yingyuan Road (Metro 2 Sun Yat-Sen Memorial Hall Exit C). This is the largest and oldest Taoist temple in the city. Hualin Temple (华林寺 huá-lín-sì) (Metro 1 Changshou Lu) Free admission. Yuanxuan Taoist Temple (圆玄道观) is located in the Huadu District. It includes three Taoist buildings in one complex: Sanqing Hall, Taihe Hall and Yuanchen Hall. Sanqing Hall is the most architecturally important of the three structures, while Yuanxuan Taoist Temple has carvings of divine beings. The central hall is covered by yellow glazed tiles and decorated with the bright images of Yuqing, Shangqing and Taiqing, the three authoritative deities in Taoism. The temple is located near Bi Village in southwest Xinhua Town. You can take the No. 9 bus from Huadu Downtown. Admission is ¥10. Xiaozhou Village (小洲村) The village is a short taxi ride from University City. Some travelers describe this district as full of historical buildings, fruit orchards and canals and relate that, in recent years, this has become artists' haven. Others report that recent development has obliterated all traces of the village and that the district is a typical industrial suburb adjoining a huge field used as an outdoor latrine. Memorial of the Huangpu Military Academy (黄埔军校旧址 huáng-pǔ-jūn-xiào-jiù-zhǐ) is on Changzhou Island (Metro 5, Yuzhu Exit D. take 431 bus to the Ferry to Changzhou Pier.). The original Military Academy was founded in 1924 by Sun Yat-sen, with support from the Chinese Communist Party and the Soviet Union. The mission of the Academy was to create an officer corps for the new Chinese Republic. Many famous Chinese war heroes were trained here. The original site was destroyed by the Japanese in 1938. Two exhibition halls on the Campus of the Academy cover the History of the Academy with English translations. Unfortunately the other exhibition halls, such as Heroes of the Academy, do not have English translations. The site is far from the city center. Free admission. Huang Pu Gu Gang (黄埔古港) Definitely a spot worth checking out. It is the old trading port of Guangzhou, and set amongst a multitude of old style buildings akin to the hutong district in Beijing. Its cheap and full of good places to eat, as well a plethora of lovely small coffee shops by the river side to enjoy a snack and a bit of food. To get there ride the metro to WanShengWei (end of line 8) and take either a motorbike, golf cart or bus (229) to Huang Pu Gu Gang. Former Residence of Hong Xiuquan (洪秀全故居:Hóngxiùquán gùjū), +8602036861225, +8602086832232,Address:广州市花都区新华街道大布村官禄布（Guǎngzhōushì huādūqū xīnhuá jiēdào dàbùcūnguān lùbù), The former home of the quasi-Christian leader of the Taiping Rebellion that resulted in the death of about 20 million people during the late Qing dynasty. Shortly after failing the imperial examinations on multiple occasions, Hong Xiuquan became delusional and claimed to have received visions in his dreams that he was the younger brother of Jesus Christ destined to overthrow the Qing Dynasty and establish the Taiping Heavenly Kingdom in Nanjing as its capital. Shunde (顺德) One stop outside the city by light rail. There is a saying in Shunde '食在广东,厨出风城' which means when you eat in Guangdong, you are actually eating in Shunde. 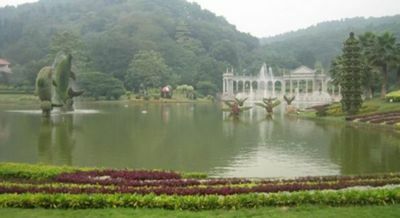 The best attraction is Shunde is Qing Hui Yuan (Chinese: 清晖园), which is one of the Four Great Gardens of Guangdong. Nearby is the famous dessert shop Ren Xin(仁信老铺), which offers a large variety of desserts including Double-Skin Milk (Shuangpinai 双皮奶). Also try 双皮奶（加红豆），伦教糕，炸牛奶，姜撞奶. Note that most museums and libraries are closed on Monday. Mausoleum of the Nanyue King (西汉南越王博物馆) , +86 20 3618-2920, 867 Jiefang North Road (解放北路878号), (Metro 2 Yuexiu Park Exit E) Discovered accidentally in 1983 during the construction of proposed shopping mall, this impressive mausoleum proves to be the most important historic discovery in South China, making it a must on any itinerary. Major display is the King's burial suit made of thousands of jade tiles. 9AM-5:30PM daily. Admission is ¥12. Guangzhou Museum (广州博物馆) , Zhenhai Tower in Yuexiu Park. Among the first museums in republic era of China, it is located in an ancient Zhenhai Tower overseeing the traditional Guangzhou regions. The museum vividly displays the history of South China. Admission: ¥10. Guangdong Museum (广东省博物馆新馆) (Metro 3,5 Zhujiiang New Town Exit B1; APM Opera House Exit C) Open 9AM-5PM, Tue-Sun. The new museum is located in Zhujiang New Town, not to be confused with the old Guangdong Museum near Metro 1 Peasant Movement Institute Station. This is the biggest museum in the city. It covers Guangzhou's history, culture, science and nature. Arrive early as admission is limited to 5,000 per day. Personal ID is required to obtain free tickets at ticket office. Guangdong Museum of Art (广东美术馆)  guǎng-dōng-měi-shù-guǎn, 8 Yanyu Road (烟雨路8号) on Ersha Island (二沙島). It shows contemporary, and sometimes ultra controversy Chinese art. Personal ID is sometimes required. Open 9AM-5PM, Tue-Sun. Guangzhou Sculpture Park (广州雕塑公园) guǎng-zhōu-diāo-sù-gōng-yuán Tongxin Road at the foot of Baiyun Mountain. Free Admission. The Memorial Museum Of Generalissimo Sun Yat-Sen's Mansion (孙中山大元帅府纪念馆)  18 Dongsha St, Fangzhi Road (纺织路东沙街18号). +86 20 8901-2366. Open 9AM-4:30PM Tue-Sun. Free Admission. Guangzhou Uprising Museum (广州起义旧址纪念馆) 200 Qiyi Road (起义路200号)(Metro 1, 2 Gongyuanqian Exit J). The Museum is at the site of the first Communist government building. Open 9AM—12PM and 1:30PM-4:30PM Tue–Fri; 10AM-4:30PM Sat-Sun. Free Admission. Guangzhou Ocean(广州海洋馆) Situated within Guangzhou Zoo, Guangzhou Ocean World covers an area of 13,000 square meters (about 139,931 square feet) and has more than 200 kinds of fish and many other rare ocean creatures. It is a high-tech exhibition hall serving sightseeing, entertainment, research and education purposes. Guangdong Revolutions History Museum (广东革命历史博物馆) 2 Lingyuan West Road (陵园西路2号大院), (Located in the martyrs memorial park. Metro 1 Martyrs' Park Exit D). Sun Yat-Sen was sworn in here in 1921 as the president of Republic of China. The museum tells stories from the Opium War to the founding of the new China. Free Admission. Peasant Movement Institute (农民运动讲习所 nóng-jiǎng-suǒ) 42 Zhongshan 4th Road (中山四路42号),(Metro 1, Peasant Movement Institute Exit C). This is the original site of Communist training center founded by Mao Tse-tung in the 1920s. Now it is a museum covering recent China revolutionary history. Open 9AM-5PM Tue-Sun. Free admission. Redtory (红砖厂)  128 Yuancun 4th Cross Road (员村四横路128号) Once a can food factory, this old can-packing factory is transformed into galleries for contemporary artists. There are also restaurants and shops, which blend in well with artistic surroundings. +86 20 8557-4346. 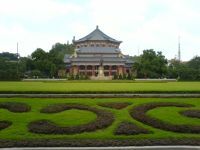 Despite its reputation for business and busy trading, Guangzhou has many historic parks everywhere, ranging from a 1000-year-old lake garden, green mausoleum for martyrs to a vast wetland dedicating for migrant birds from Serbia and Mongolia. Yuexiu Park (越秀公园) yuè-xiù-gōng-yuán, (Metro 2 Yue Xiu Park Station Exit B1) is the largest urban park in China and is a lush green area that flows over acres of hills and includes several lakes. It includes the Ming Dynasty Zhenhai Tower (镇海楼) zhèn-hǎi-lóu, now home to the Guangzhou Museum with relics on five floors dating back 5,000 years ago and an up-to-date miniature of modern Guangzhou. Admission is ¥10. Hours 9:00 - 11:30, 13:00 - 17:00. Also check out the Stone Statue of the Five Rams (五羊石像), the symbol of Guangzhou (See Understand). Open 6AM-9PM. Free Admission. Lingnan Impression(岭南印象园) (Metro 4, Higher Education Mega Center South Exit B)  This is a place to see the city's past before the economic boom. The park is 15 minute walk from the subway station. Free shuttle is available on the weekend. Admission is ¥60. Baomo Garden (宝墨园) is located in Panyu District, rebuilt in the 1990s from a destroyed ancient garden. Hours 8:30AM-6:00PM; Admission is ¥45. Huanghua Gang Commemoration Park (黄花岗公园), huáng-huā-gǎng-gōng-yuán,  79 Xianlie Middle Road (先烈中路79号) +86 20 3758-8321. Open 6AM-8:30PM. This is a park that will set you in a poignant mood. The main attraction is the monument built to commemorate the 72 martyrs who died during the 1911 uprising. Free admission. Guangzhou Martyrs' Memorial Garden (广州起义烈士陵园) guǎng-zhōu-qǐ-yì-liè-shì-líng-yuán) Zhongshan 2nd Road (中山二路),(Metro 1 Martyrs' Park Station Exit D)  This park is dedicated to those who fought and died in the Communist Uprising in 1927. Hours 6:00AM-10:00PM; Free admission. Yuntai Garden (云台花园)(Tour Bus No. 1, 3)  yún-tái-huā-yuán is situated at the foot of Baiyun (White Cloud) Mountain and is famous for its wide variety of rare flowers and trees. There are also seasonal exhibits (additional admission). Admission is ¥10. Xiangjiang Wild Animal Safari Park (香江野生动物世界) xiāng-jiāng-yě-shēng-dòng-wù-shì-jiè is in Panyu district. Hours 9:30-18:00; Admission is ¥180. Green Walk(东濠涌)(Metro 1, Peasant Movement Institute) This is in Yuexiu District, under the Donghaoyong Elevated Road. Taoist temple Five fairy Taoist temple is located in Hui Fu Xi Lu of the center of Guangzhou. is the historical markers of that Guangzhou has been founded 2000 years. Million Sunflower Garden(百万葵园) Sunflower Garden million theme park, located in Panyu, Guangzhou Wanqingsha town, covers an area of 260,000 square meters, planting one million sunflower, become the first in the country house, all imported seeds (mainly Japan) ornamental sunflower park. Chimelong Paradise (长隆欢乐世界) The theme park has many thrill rides and shows. Hour: 9:30-18:00 (18:30 weekend); Admission is ¥200. Chimelong Water Park (长隆水上世界)  This is a western style water park with great water rides. Hour: 9:30AM-10:00PM, April to Mid-October; Admission is ¥140 (fall) - ¥250 (summer). Guangzhou CrocoPark (广州鳄鱼公园) You can see, play, touch, take pictures of crocodiles and even eat and buy stuff made of them! Guangzhou Metro Line 2, Huijiang Station. Guangzhou Xiangjiang Safari Park (广州香江野生动物世界) Day safaris and night safaris offered, mini jungle train, free ranging animals. Guangzhou Metro Line 3, Hanxi Changlong Station, take exit E, there are scheduled free shuttles to all the Chimelong parks. Chimelong International Circus (长隆国际大马戏) The closest China gets to Cirque du Soleil, 250/adult, 125/child or senior. Hanxi Changlong, exit E, free shuttle. Baiyun Mountain (White Cloud Mountain) (白云山 bái-yún-shān) is a great place to relax and enjoy a day among lush, rolling hills. It also offers great views over the city. The road to the top in most of the daytime is restricted to park trams and pedestrians. To get to the top lookout point, you can use the main roads or trails. There are many places to rest and refreshments are available along the way. It is a great place to see people enjoying nature and playing games, such as shuttlecock, badminton, football and even bungee jumping. There are many bus routes to and from different parts of the city, as well as taxis usually available near the park gate. Open 24 hours. Park entrance ¥5; Cable car round trip ¥40; tram from ¥20; other attractions ¥5-¥10; packages available from ¥25. Lianhua Shan (Lotus Mountain) (莲花山 lián-huā-shān) features an impressive quarry from which red sand stones were mined about 2,000 years ago, a pagoda from 1612, and a barrack from 1664. The obligatory statue of Guanyin, the Buddhist Goddess of compassion, at the side of the Buddhist temple is also not to be missed. From Guangzhou, take Metro line 4 and exchange bus line 92 or 93 at Shiqi Station. There are ferry services from Guangzhou at Tianzi Pier (天字码头)(¥20) and Xidi Pier (西堤码头)(¥25). The boat leaves at 8:15AM and returns at 3:15PM. Admission is ¥50. For in-depth skills and knowledge on the Chinese language and culture, the Guangzhou University, on the university island in Guangzhou, offers international students courses on the Chinese language (Mandarin), the Chinese culture, economy and law. An exchange semester in Guangzhou University's international study abroad program is ideal for all students interested in China, international economy and international affairs in general. Most of the participants are students of business, technology, political science and tourism. Guangzhou University, in its present form, was founded in 2000, when Guangzhou Normal University, the South China Institute of Construction, Guangzhou University, Guangzhou Junior Teachers' College, and the Guangzhou Institute of Education were combined into one institution. Guangzhou University’s history, however, dates back to 1927 and the university was given the power to grant degrees in 1984. GU is a public university funded by the Guangzhou Municipal Government and recognized by the Ministry of Education in China as well as the International Association of Universities (IAO). Mandarin House Guangzhou School (广州美和汉语学校 Guǎngzhōu Měihé Hànyǔ School)  offers intensive & business courses to HSK preparation to all levels. Sun Yat-sen University (中山大学 Zhongsan Daxue) Founded by Republican China's (and Guangdong's own) revolutionary hero. Offers full-time Manadarin language program to foreigners at various levels. Attracts students from all around Asia and the world. Program is located in the beautiful and historic south campus in Haizhu District. Locals on the run outside the Grandview Plaza in Tianhe District. In the background is the 80-story CITIC Plaza. If time and weather permit, walking is perhaps the best way to see the city as the back alleys, which are littered with antiquities, are not accessible by motorized vehicles. Most trades and goods categories are concentrated in a specific area or along one main street. Qingping Market (清平市场) Qingping Road (清平路),(Metro 1 Huangsha Exit D) It is located North from Shamian Island. Cantonese are known to eat just about any animal, and the market is world famous for its wild animal trades, although it has been tamer since the SARS outbreak. It is still a great place to go for exotic goods. The modern front of the market has quite a few stalls selling dried herbs used in Chinese Medicine. The real charm here lies just behind the modern exterior. The modern exterior is built onto a series of old historical narrow alleyways with shops selling herbs. Xiguan Antique Street (西关古玩城) near Liwan Park (荔湾湖公园). Flower Street (花卉水族街) Baohua Road (宝华路). Ivory and Sea products (象牙雕刻海味街) Daxin Road (大新路). Bridal Street (婚纱专卖街) Jiangnan North Road (江南大道北) (Metro 2 The 2nd Workers' Cultural Palace). Household Merchandise Street (日用百货街) Gaodi Street(高第街). The street has become a shopping center selling everyday goods. Cultural Street (古玩字画街 / 文化商业街) Wende Road(文德路),(Metro 1 Peasant Movement Institute). This is a good place to look for antiques and traditional Chinese artistic goods. Haiyin Shopping District (海印专业购物区) is located at the northwest side of the Haiyin Bridge (海印大桥), selling appliances, sporting goods, cloth, fabrics, camera accessories and electronics. Beijing Lu Pedestrian Street (北京路步行街 běi-jīng-lù) (Metro 1, 2 Gong Yuan Qian Exits C, D) This is the main shopping thoroughfare, a pedestrian street where most stores are open from 9AM-10PM. Avoid individuals who solicit pirated DVDs and imitation goods. Don't follow anyone into the small dark alleys in between buildings to see their goods. Remember to visit Mayflower Plaza (五月花广场 wǔ-yuè-huā-guǎng-chǎng)[] 68 Zhongshan 5th Road (中山五路68号), at the northern end of the Pedestrian Street. This is a place where young people hang out and shop. Shangxiajiu Pedestrian Street (上下九商业步行街 shàng-xià-jiǔ) (Metro 1 Changshou Lu Exits D1, D2.) This shopping area is also a showcase of traditional Cantonese architecture Qilou(骑楼). It is particularly pretty at night when lights are lit up. Prices here are generally lower than Beijing Road's, but prepare to bargain. Remember to visit Liwan Plaza (荔湾广场 lì-wān-guǎng-chǎng), located at 9 Dexing Road (德星路9号), the east end of the street. You will find a good selection of crystal there. Taikoo Hui (太古汇)  (Metro Line 3, Shipaiqiao) A fancy latest shopping mall that targets affluent customers. L3 has several western cafes and bistros which are popular among expats and local bourgeoisies. The bookshop in L1, Fangshuo, is one of the fanciest bookshop of its kind in China, which has a fair collection of English books as well. China Plaza (中华广场 zhōng-huá-guǎng-chǎng). 33 Zhongshan 3rd Road, (中山三路33号),(Metro 1 Martrs' Park) The mall is extremely popular among young locals and displays what they think "fashionable". Located on top of a metro station, it also has a huge food court which serves anything from Sichuanese spicy food to Japanese Sushi. Grandview Mall (Zhengjia Plaza) (正佳广场 zhèng-jiā-guǎng-chǎng)  228 Tianhe Road, (天河路228号),(Metro 1, 3 Tianhe Sports Center Exit D3). +86 20 3833-0098. This is the largest mall in Guangzhou, located in the heart of Tianhe District. It includes famous fashion stores and several department stores, and some cheesy music fountains. Tee Mall (天河城 tiān-hé-chéng)  208 Tianhe Road (天河路208号)(Metro 1 Tiyu Xilu). Located right above the metro Tiyu Xilu station, this is one of the most popular shopping mall. Dashatou Pier (大沙头码头), Tianzi Pier (天字码头), and Xidi Pier (西堤码头) – This is a one to two hour cruise in the evening and a great way to see the Guangzhou skyline along the Pearl River, including a light show at Bai-E-Tan. Tickets for the deluxe dinner cruise can be bought from most high-end hotels. Prices from ¥50-¥200 per person. Higher end cruises usually include dinner buffet. There is a vast system of small streets and alleys, greenways, boulevards and parks that are great for cycling. You have the opportunity to explore parks, temples, outdoor markets and the quieter residential areas of Guangzhou. Some hostels have a bike rental service for as cheap as RMB5 per hour. There is a vast network of undeveloped hutong streets south of Chan Clan Academy, where a tourist can enter the daily lives of the people living in these small alleys. Cheap and safe. The electric trams are even cheaper at flat rate of ¥2. Hop on to any one of the public buses. Drivers are generally very friendly and helpful. So long as you have sufficient small change for the journey, tell the driver you are in just for a joyride. (In cantonese Yau Cheh Hor literally meaning just for the ride or just for fun. Where the journey terminates, ask anyone what buses will take you back and request the driver to let you know when to get off. So long as you sit not too far away, he (sometimes she) will tell you. Don't worry, everyone is very helpful on these buses. Being paranoid about scams and perceived crimes takes the joy out of what would otherwise be a marvellous holiday. Chinese New Year/Spring Festival (春节 chūn-jié) occurs on first day of first lunar month, usually in January or February. This is a 15 day celebration and some districts can be quite deserted as many migrant workers return to their home provinces. The flower fair is popular during the days before New Year. Dragon Boat Festival (端午节 duān-wǔ-jié) on fifth day of fifth lunar month, usually in May or June. This festival commemorates the sacrifice of Qu Yuan (屈原), a famous poet who drowned himself in the river by way of making a statement against government corruption during the Warring States Period. The highlights are dragon boat racing along the Pearl River, and eating rice dumplings wrapped in bamboo leaves (粽子). Mid-autumn Festival (中秋节 zhōng-qiū-jié) is on the 15th day of 8th lunar month, usually in September or October. Cantonese moon cakes are enjoyed during this holiday. Lian Xiang Lou and Taotao Ju's moon cakes are especially famous (see "Eat" section). Kids' favorites are paper lanterns. Many locals also enjoy riding ferries and watching the full moon on the Pearl River. Tomb Sweeping Day (清明节 qīng-míng-jié) is around the spring equinox, usually on April 5th. Involves visits to the family tombs for cleaning and making offerings. Double Ninth Festival (重阳节) is on the 9th day of 9th lunar month, usually in October. Cantonese has the tradition of hiking up Baiyun Mountain. This is also the fall version of the Tomb Sweeping Day in April. Qi Xi, or Chinese Valentine's Day (七夕 qī-xī) is on 7th day of 7th lunar month, usually in August or September. According to legend, a heavenly fairy Zhinu (织女) fell in love with a mortal farm boy Niulang (牛郎). This was forbidden; as punishment, they were only allowed to meet once a year on this day. There are usually parades and carnivals in the city celebrating the holiday. This is the Chinese equivalent of Valentine's Day, but it is steadily losing its appeal among the locals; many have adopted the Western Valentine’s Day on February 14th. Winter Solstice (冬至, 过冬 dōng-zhì), which literally means the Coming of Winter is on December 22nd. Traditionally, Cantonese people observe the day with a family feast, which often includes preserved duck and sausages. However, the highlight of the day's festive dishes is hot soup served with flour dumplings (汤丸). Canton Fair  (China Import and Export Commodities Fair) held twice a year in Guangzhou since 1957 and is the largest trade fair in China. It has the largest assortment of products, the largest attendance, and the largest number of business deals made at the fair. Canton Fair is held in the Pazhou Complex at 380 Yuejiang Middle Road (阅江中路380号) (Metro Line 8 Xingangdong or Pazhou station). If you are going to the fair, book a hotel well in advance. Hotels tend to be booked and expensive during the Fair. Metro is the best transportation option to go to the fair ground, while many hotels provide free shuttle services. Cantonese cuisine is well-known for its blend of color, fragrance, taste and presentation, and it is ranked among the top four in the country. In particular, dim sum, a delicate pastry, is famous for being simple yet delicious. Local customs, as well as a long history of contact with the West compared to other regions in China, have played a major role in the development and diversity of Cantonese cuisine. Chinese food served in Western countries is usually Cantonese food, albeit slightly adapted to Western tastes, meaning that most Western visitors from large cities will be familiar with Cantonese food to a certain extent. That being said, authentic Cantonese cuisine is also famous throughout China for another reason - Cantonese people eat absolutely anything, and it is often said that Cantonese people eat anything that has four legs other than a table, anything that flies other than an airplane, and anything that swims other than a submarine. In addition to that, various internal organs of animals are regularly eaten, such as the liver, kidneys, heart and even brain. This means that Cantonese cuisine is one of, if not the most adventurous in China due to their expansive use of exotic ingredients, and their extremely broad definition of what is considered edible. This is how Guangzhou earned the distinct name of "Eating in Guangzhou (食在广州)." Yum Cha / Dim Sum (饮茶) "A pot of tea with two pieces (一盅两件)" is Guangzhou's dim sum culture. Many locals stay for hours chatting and reading newspaper with just a small order of food. The varieties of dim sum dishes in many restaurants are easily over a hundred. The bite-size quantity of each dish allows one to venture out and try new things that will satisfy one's taste bud. Siu Mei / Shao Wei (烧味) Cantonese barbecue is famous around the world where many have seen the image of roasted ducks and chicken hanging in front of a store. Siu mei is a staple item in Cantonese restaurants. Some Varieties include barbecued pork (叉烧), roast goose (烧鹅) and roast pig (烧肉). Seafood (海鲜) Eating fresh seafood the Cantonese way is a good way to explore Cantonese culture. From picking live fish or lobsters in front of your eyes to eating the sea creatures with their heads attached, this is a great advanture for any visitors. Dessert (甜品,糖水) A Cantonese meal is not complete without Cantonese desserts. Soupy or custard desserts are common. Two distinct Guangzhou favorites are double layered milk (双皮奶) and ginger milk curd (姜撞奶). Other popular choices include tofu pudding (豆腐花), red bean paste (紅豆沙), green bean paste (綠豆沙), guilinggao (龟苓膏), black sesame paste (芝麻糊) and sago (西米露). Foreign fast food, ice cream and coffee chains are well established in Guangzhou. These include Subway (赛百味), Dairy Queen (冰雪皇后), Saizeriya (Japanese Italian Food Chain), Papa John's Pizza (棒约翰), KFC (肯德基), Pizza Hut (必胜客), McDonald's (麦当劳), Burger King (汉堡王), Starbucks (星巴克) and Häagen-Dazs (哈根达斯). Most of these can be found in the Zhengjia Plaza (See "Shop"). Convenience stores are on almost every street corner and most are open 24 hours. Major convenience store chains include 7-Eleven, FamilyMart, Circle-K and C-Store. Prices are a little higher than in local shops or supermarkets, particularly at 7-Eleven. Some FamilyMarts and Circle-K's do not sell cigarettes, but C-store does. Corner's Deli is a specialty food chain store with several locations in the city with a good selection of imported foods. One of the locations is at unit 6, Backstreet, CITIC Plaza. TESCO (乐购) The British hypermarket is located on Zhongshan 6th Road above the Metro Ximenkou Station and it is the largest supermarket in Guangzhou on a single premise. Park 'n' Shop (百佳) This Hong Kong chain has several locations ranging from convenience stores to hypermarkets. The largest stores are in the shopping mall above Metro Changshou Lu Station and at Tianhe North Road close to the Longkouxi bus stop. It is a little more expensive but has a good selection of imported groceries. ÆON (永旺)There are several locations including Tee Mall at Tiyu West Road and Linhe Middle Road near the East Train Station. This Japanese chain has a good selection of imported groceries. Carrefour (家乐福) This French hypermarket has four stores in Guangzhou. One of them is at Kangwang Road (康王中路656号) near Chenjiaci station. It is cheap and has a good selection of products. Trust-Mart (好又多) The lower-end market has numerous locations in Guangzhou and it is recent acquired by Wal-Mart (沃尔玛). It will be soon re-branded to Wal-Mart. Wal-Mart has been upgrading the stores, and the prices while they are at it. This chain has a large stock of non-food items but the grocery selection is limited. It is often crowded on the weekends. Vanguard (华润万家) This is the flagship operating supermarket chains of China Resources. It is the third largest supermarket chain in Hong Kong. It operates approximately 450 stores in China. There are over 20 stores in Guangzhou. When it comes to drinks, Guangzhou is one of the best cities in China to knock back a few. With a relatively large population of foreigners here, the city offers a wide variety of nightspots that cater to all tastes. Tsing Tao and Zhu Jiang are the two major Chinese beer brands that are sold almost everywhere. Both are fairly standard light lagers. Carlsberg is also brewed in Guangzhou, which explains the reasonably large amount of Carlsberg taps in the bars. Nightlife at Shangxiajiu in Liwan District. The culture of tea drinking, also known as Yum Cha (饮茶), runs deep in Guangzhou. After all, the city was at the center of the massive tea trade that existed between China and Europe during the 19th century. WARNING: Foreigners MUST present an original passport with a valid visa for staying at a legal hotel or hostel. Many wikitravellers have reported troubles during check-in when their passports were held by other consulates or PBS office for applying for or extending a visa. Make sure to check in first at hotels/hostels before applying any visas. If you don't have an original passport, don't expect mercy from hotel receptionists, who may face a prison term and heavy penalty if they allow you to stay without a passport. Guangzhou has Public Security Bureau (PBS) 's Exit and Entry Office for renewing visa for staying at China. When submitting your application, you need to present a Temporary Residence Registration Form (临时住宿登记, Linshi Zhusu Dengji) , which is issued only by legal hotels and hostels. Consult front desk staff. NOTE: Beware when booking any hotels around Guangzhou South Station (廣州南站). Most of the hotels here that carry brand names, such as Home Inn (儒家), 7 Days Inn (7天連鎖酒店), etc. are FAKE and you'll end up staying in a dodgy, unclean place. Those hotels do not actually have branches near South Station. Avoid staying in this area if at all possible. Guangzhou's hostel scenes are more vibrant than ever. Some hostels are as big as a well established hotel. There are also a lot of apartment-converted small hostels which are subject to frequent government crackdown. Cross check before booking. Guangzhou is not as well known as Beijing or Shanghai as a hub of foreign commerce and trade - perhaps unfairly, as it's the center of manufacturing in China. Most people on the planet are no further than a few feet away from an object produced in in the Guangzhou metropolitan area at any given time. This includes the components of the screen you're reading this on. While there may not be as many opportunities for foreigners here compared to Beijing or Shanghai, this massive city and its rapidly growing economy does offer some work for foreigners - management, translation, engineering and teaching English. There are a number of large ESL school chains, owned by foreigners, in the area who hire (mainly) North American teachers. As with any rapidly growing industry, there are many sketchy companies trying to make a buck. If you want to work as an English teacher in Guangzhou - which can be an amazing experience - make sure to verify the credentials of the school. English teaching jobs are available teaching a range of ages from kindergarten to elementary, middle and high school students as well as universities and private language centers. Schools usually require native speakers with a degree in any discipline and TEFL certificate. Violent crimes are not common. As one of the first open ports in China, Guangzhou is known for its liberalism and general tolerance of cultural differences. Crimes that target foreigners are rarely heard of but pickpockets could happen in shopping areas and transportation hubs. Teahouse scams, which are serious problems in Beijing and Shanghai, have not been reported in Guangzhou. A possible scam is when a taxi driver refuses your notes and tells you it is fake. What happens is that the taxi driver changes your note for a fake one without you noticing. Always be suspicious when a vendor refuses your money and gives it back to you. As the third wealthiest province of China, it has attracted enormous immigrant workers both from other provinces and overseas. The local police has Arabic- and English-speaking forces to deal with the rising drug trade involved with foreigners, who are not exempted from the death penalty for drug trafficking. Traffic conditions in Guangzhou have drastically improved in recent years and rules are practiced - relatively. However, like everywhere else in China, cars do not yield to pedestrians and zebra crossings are for display only. Emergency numbers are: Police: 110; Fire: 119; Medical: 120; Traffic accident: 122. The area dialing code for Guangzhou is 020. From overseas, dial +86 20 XXXX-XXXX. Phone numbers are 8 digits. Mobile numbers are 11 digits and city code is not required. Tourism Administration of Guangzhou Municipality (广州市旅游局)  13-15/F, 140 Dongfeng West Road. (东风西路140号13-15楼). +86 20 8107-8200. Internet is prevalent in Guangzhou. Many western chain restaurants such as McDonald's, Subway, Starbucks, offer an easy access to Internet. Many major public places are now covered with free wifi (ssid: wireless_GZ), including the Baiyun International Airport, libraries, public parks, hospitals, railway stations and several shopping centers. Police: The Public Security Bureau Exit-Entry Administration Division is located at 155 Jiefang South Road (解放南路155号) +86 20 8311-5808 (M-F 8:50AM-11:30AM, 2:30PM-5PM.) You can get your visa extension done here. ATMs that accept foreign credit or debit cards are common in shopping malls and tourist areas. Withdrawal is available in Chinese currency only. Most banks in the city center also accept exchanges from your local currencies to ¥. Your passport is required for this service. Some banks allow you to change back to your local currency with the original exchange memo. Bank of China (中国银行)  There is a branch inside Garden Hotel. ATM is available on the ground floor of White Swan Hotel and over 100 locations in Guangzhou. Their ATMs are the best bet for using foreign cards. HSBC 2, G/F, Garden Hotel, 368 Huan Shi Dong Lu +86 20 8313 1888. Citi  Unit 101, Fortune Plaza, 118 Tiyu East Road. +86-20 3898-1688. This bank has a full service branch with currency exchange services and 24-hour ATMs. Bank of America  Rm 2506, 555 Renmin Middle Road +86 20 8130-0888. The bank has alliance with China Construction Bank. Few lower end hotels and hostels have coin-operated self-service laundry room. Self-service laundromats are not available on the streets, although dry clean and laundry stores are available to clean your clothes. Normally you can drop your clothes off and pick them up the next day. One laundry chain is Tiantian (天天洗衣), which is conveniently located in most Metro stations. There are many stores on Shamian Island that have laundry service. An average load of laundry costs about ¥100. In other parts of the city, there are laundry and dry clean shops sprinkled throughout neighborhoods. An average load should cost no more than ¥40. If you are doing sheets and blankets, they should charge no more then ¥10 for a blanket, ¥30 for a quilt. Dry-cleaning a sweater is about ¥8. Guangzhou Television (GZTV)  has an "English" channel, now called Guangzhou I Channel (but still "English" according to the Chinese name), offering entertainment and cultural programs from around the world, mostly dubbed in Mandarin and subtitled in Chinese. Hong Kong’s international channels, TVB Pearl and ATV World, available in most hotels, have a great selection of programs from the UK and US, plus news at 7:30pm and late (11pm or later) every day. The China Daily and/or Global Times are the two only English language newspapers available in Guangzhou (unless you go to a library), and both can be found on newsstands throughout the city. There are several bookstores throughout the city that sell current English and Foreign periodicals. The South China Morning Post from Hong Kong is also available by subscription only. South China TALK is a monthly English-language magazine based in Guangzhou. All the religious sites listed in the See section are open to worshippers. Muslim: Huaisheng Mosque (怀圣寺 huái-shèng-sì) at 56 Guangta Road (光塔路) (Metro 1 Ximenkou) is exclusively open to Muslims. Jumu'ah (صلاة الجمعة‎) is held every Friday just after noon. Most public parks offer free gym facilities. For serious bodybuilders, Total Fitness  has around 15 branches which are usually close to metro stations. Membership costs about ¥2000-4000 a year, depending on your bargaining power. Guangdong Provincial People's Hospital is near the Garden Hotel. 106 Zhongshan 2nd Road +86 20 8382-7812, +86 20 2062-2031. Kaiyi International Dental Care  Ice Flower Hotel, 2 Tianhe North Road +86 20 3886-4821, +86 20 3387-4278. China Post, the official post office, is your best bet for regular letters and postcards. For packages, other than the post office, there are many shipping centers around the city who are agents for DHL, FedEx, UPS, TNT and EMS. There are usually shipping counters at higher-end hotels. Ask your hotel for the nearest shipping locations. Post Office (China Post) - Post Office is usually slow and little English is spoken. EMS service is available through the post office. The following are locations close to tourist areas. Shamian Post: Shamian 3rd Street (沙面三街) 9AM-5PM, closed on Sunday. Liuhua Post: 151 Huanshixi Road (广州市环市西151号) between Guangzhou Railway Station and the Provincial Coach Terminal. DHL  There is a branch in Garden Hotel +86 20 8384-9210. UPS 1121 Guangyuan Middle Road, +86 20 8657-9898; China Hotel, +86-20 8666-2696; TeeMall +86 20 8230-4008. There have been reports of mail not reaching its destination. Packaged mail was said to be held up in Shanghai and is undeliverable. 800 RMB was demanded for its return. The dwellings of overseas Chinese from the early 20th century in Kaiping (开平). Take a 2-hour bus form Fengcun Bus Station (芳村汽车站) (Metro 1 Kengkou Exit B) ¥60. Foshan (佛山) is only an hour away from Guangzhou. Famous for its Ancestry Temple (祖庙), it is also the home to legendary martial art master Wong Fei Hong. Take the Foshan Metro at the Xilang Station of Guangzhou Metro Line 1. Hong Kong (香港) is 2-3 hours away, depending on the modes of transportation. Humen (虎门) in Dongguan (东莞) is famous for its Opium War era relics (虎门销烟). It is a bridge away from the Nansha District. Most trains going to Shenzhen or Hong Kong stop at Dongguang. 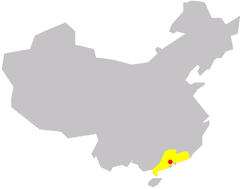 Shenzhen (深圳) is located on the border with Hong Kong. It is one of the first special economic zones in China. Check out theme parks such as Windows of the World, the China Folk Culture Villages and Splendid China. Bus and train services are run frequently. The trip will take 1 to 2 hours. Tickets cost around ¥60 - ¥80. 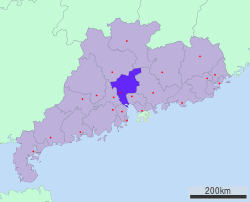 Zhuhai (珠海) is another special economic zone to the south bordering Macau. You can get a bus ride from any of the major bus stations in the city. You can also take a high speed train at the South Station (Metro 2 Guangzhou South Railway Station) and it only takes about 45 minutes (¥44). This page was last edited on 8 April 2019, at 04:24.